Roshan was one of those very rare composers with great confidence who indeed had fascinated me a lot in my early childhood days. His all-time evergreen song from the Rajashri Productions film Aarti titled — Rahe na rahe hum maheka karenge ban ke kalee ban ke fiza — by Lata Mangeshkar still fascinates me. 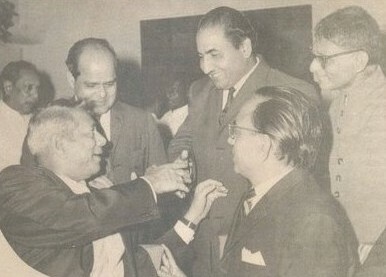 In addition there were several other great compositions which Rafi Saab has rendered under the music supervision of Roshan. Who can ever forget the great Quwali of Barsaat ki Raat titled â€“ Ye ishk ishk Hai with Manna Dey where Mannada had exclaimed that when Rafi Saab came on the mike & started his lines titled — Jab jab Krishna kee bansee baje nikhale Radha saja ke — Manna Dey almost forgot his lines. In fact like the other greats like Jaikishan, Shailendra, Madhubala, Geeta Bali & Gurudutt Roshan too had left for his heavenly abode almost at a very young & tender age of 36 years. May the soul of all the above Greats rest in eternal peace!!! This entry was posted on Sunday, February 8th, 2009 at 7:11 pm	and is filed under Meri Awaaz Suno. You can follow any responses to this entry through the RSS 2.0 feed. You can leave a response, or trackback from your own site. Thanks for sharing some of your favorite Rafi – Roshan songs. I listened to a few that I hadn’t heard of. The songs of Valla Kya Baat Hai were very lively and energetic. I was surprised this was Roshan because I was expecting something slower and thoughtful but that album was great. Ab Kya Misaal Doon is of course one of my favorite songs of all time. Roshan really tailored a supreme song that would take advantage of Mohammed Rafi’s magic. Rahe na rahe hum mehka karenge- is from the movie Mamata(1966) and not Aarti.. Mamata featured Ashok Kumar, Dharmendra and Suchitra sen in a double role.. Apart from Lata’s “rahe na rahe hum”, the other great songs of this movie are “In baharon me akele na firo, raahon me kaali ghata rok na le”(Rafi-Lata) and “Chhupa Lo yun dil me pyar mera”(Hemant-Lata)..
Roshan lived from 1919-1968, so, he lived for 49 years and not 36..
Roshan Sb has created great compositions which are inevitable. All songs of movie Babar were great hits. Meri Mohabbat Qabool Kr Lo sung by Lata Jee is a great song from movie Babar. Qawali “Ishq Ishq” is the greates Qawali ever specially entrance of Rafi sb is stunning. Thanks for sharing this great experience with Rafi Sahab. I believe that people who are very extra ordinary are not bless with age. Roshan Lal Nagrath (Roshan) is one such personality, who has composed songs which are a landmark in Bollywood. The qwaalis composed by Roshan are the best ever composed in the history of Bollywood. Rafi-Roshan combo have given us a few ultimate gems which will remembered for years to come. I will add a few gems to the list. I can say the Rhitik Roshan is very unfortunate for not having seen his Grand Father. the music of the filim saanj aur savera is not performed by roshan,its md is sanker jaikishen.in the filim baber rafi saab had sung a fine song tume ekbaru muhabat…under the baton of roshenji. Thank you Mr.Bijoor for taking me back into nostalgia. It helps a lot to think about that glorious golden period. My whole spirit gets enlightened and I get rejuvenated fully. This is the energy that keeps me going in this world of world devoid of simplicity. The songs mentioned by you are all masterpieces that Roshan composed. The glow and the warmth of those moments will always be unmatched. Thank you once again. Small & fruitful little piece Sir. Roshans orchestra piece in fact had the best violinist team ever better than the piece of Naushad Saab. Two small corrections in an otherwise interesting article. 1. “Rahe Na Rahe Hum” duet of Rafi-Suman is from “Mamta” and not from “AArti”. 2. Music of “Aja Huna Aaye” from “Saang Aur Savera” was by SJ and not by Roshan. 1. Cha Gaye Balam – Asha duet in Chitralekha. 2. Jaane Wo Kaun Hai Kya – Bheegi Raat. 3. Aise To Na Dekho – Suman duet in Bheegi Raat. 4. Sun Ae Mahajabi – Dooj Ka Chand. 5. Mehfilse – Dooj Ka Chaand. 6. Chand Takata Hai Idhar – Lata duet from Dooj Ka Chand. 7. Baar Baar Tohe Kya Smjaun – Lata duet from Aarti. Rafisahab-Roshanji was one of the better combos we’ve had. Roshanji was possibly the one who used the ‘soft-n-silky’ property of Rafisahab’s voice, the best. Hearty thanks & congratulations for sharing a great title of Roshan-Rafi combination with some wounderful songs. Barsat Ki Raat, Taj Mahal & Bheegi Raat were the great film of this combination. Till date the songs of these combinations refreshing all of us with romantic feelings.